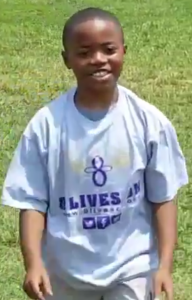 Congratulations JaShaun, for being a recipient of the 8 Lives On “Help A Child Play” Youth Activity Scholarship! JaShaun is an outstanding athlete with natural ability and talent. This Fulton Falcon senior has participated in football for 3 years and has grown tremendously in character on and off the field since his freshman year. JaShaun has received several combine invites in many different cities and states and has excelled in every one of them. Just this past May, he received the MVP at the Nike combine in Hendersonville, TN. This recognition only adds to his many accomplishments. JaShaun hard work and dedication has gained him multiple football MVP awards, player of the week 4 times last season, and an all-around player award just to name a few. JaShaun’s athletic ability doesn’t stop there. He is also a tremendous force on the basketball court and in track and field. Planning for his future, JaShaun is pursuing collegiate goals to attend a Division I University and major in sports and physical therapy. His top 3 picks are Ohio State, University of Louisville, and Michigan State. From there he wants to play for the NFL. When he’s not on the field or court, JaShaun is actively involved with Lomax Temple A.M.E. Zion Church youth group, choir, and dance ministries. 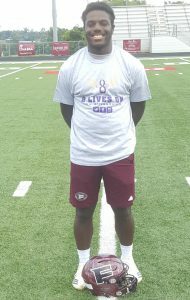 JaShaun, we at 8 Lives On wish you and the Fulton Falcons Family much success this football season and throughout your athletic career. Congratulation Joseph, for being a recipient of the 8 Lives On “Help A Child Play” Youth Activity Scholarship! Joseph is an incredibly brilliant all-star cheerleader and platinum level gymnast. who in a brief time has proven to be an essential member of his Cali Sharks team at Premier Athletics. He demonstrates reliability, talent, helpfulness, and routinely pushes to better himself. He is also becoming a master at time management, goal setting, and following through which are all necessary skills that will help guide him on his journey to success. In addition to his worship, Joseph sings with the Mount Calvary Baptist Church Choir and is likewise highly recognized for his performing arts skills at Gresham Middle School. Joseph, we at 8 Lives On want to wish you and the Premier Athletics Sharks Junior All-Star Cheerleading Team success this year and throughout your athletic career. 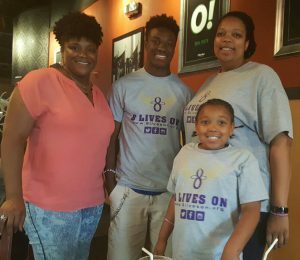 Congratulations DaShawn, for being the 8 Lives On Fall 2016 “Help A Child Play” Youth Activity Scholarship Recipient! DaShawn is an amazingly caring and intelligent seven-year-old athlete who developed a passion for football at the age of four. Playing both offense and defense, DaShawn is truly a versatile player. He takes each snap with heart and determination and strives to do his very best every time he steps on the field. He challenges himself by training and conditioning with his dad and older siblings to help prepare him with fulfilling his dream of one day playing for the University of Alabama. For now, DaShawn plays with the 7U Central Bobcats team under Head Coach Dennis Long. Coach Long states that DaShawn is a great kid to work with and compliments him for both his hard work and his dedication. Not only does DaShawn display MVP qualities on the field, he excels in the classroom as well. DaShawn attained all A’s with the exception of one B and received the Dogwood Elementary First Grade Math Wizard Award for the 2015-2016 school year, as well as many other academic achievements. Although DaShawn demonstrates great passion for football, his love for God and family is at the top of his list. He has worshiped and actively participated in youth activities at Hillcrest United Methodist Church for over three years. Youth Director Sara Vittetoe says he has shared his love of football on several occasions and always brings a smile, along with his wisdom and insight, to their Sunday school class. DaShawn’s scholarship will cover his football fees, the cost of his uniform, and the cost of his shoes. DaShawn, we at 8 Lives On want to wish you much success this football season and throughout your athletic career. 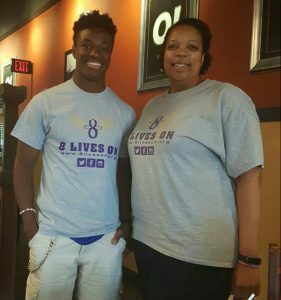 Congratulations to Elijah for being the first recipient of our 8 Lives On Youth Activity Scholarship. Elijah is a young talented wrestler from Knoxville, Tennessee, who developed a passion for the sport during his football off-season. He joined his first wrestling team while in middle school in Morristown, Tennessee -placing fifth in the state tournament that year and second the following year. This season, Elijah padded his stats with twenty-six wins and placed third in the regional tournament for his high school team. Elijah’s hard work and determination gained him an invitation to represent Tennessee on the DownUnder Sports Central Conference Wrestling Team in Australia this summer. He will spend nine days mastering his freestyle wrestling skills, competing, and experiencing the beautiful sights of Australia. In addition to his nine-day stay, Elijah will also enjoy three days relaxing and exploring Waikiki, Hawaii. 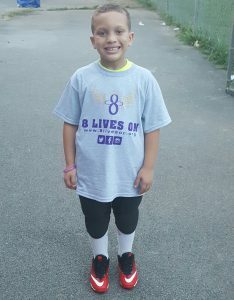 Elijah, 8 Lives On wishes you success at the DownUnder Sports Central Conference Tournament this summer and throughout your athletic career. If you would like to help a child like Elijah fulfill their dreams, please donate today! 8 Lives On gives special thanks to all of our supporters. Together, we can Help A Child Play! Marilyn Johnson on Congratulations, DaShawn W! Mrs.Sara and Mr . Robert on Congratulations, DaShawn W! Elijah on Congratulations, Elijah D! Tynesha Davis on Congratulations, Elijah D! Kisha on Congratulations, Elijah D!